Welcome to Grapevine Physical Therapy & Sports Medicine's patient resource about Hip problems. The hip joint is a true ball-and-socket joint. This arrangement gives the hip a large amount of motion needed for daily activities like walking, squatting, and stair-climbing. Understanding how the different layers of the hip are built and connected can help you understand how the hip works, how it can be injured, and how challenging recovery can be when this joint is injured. 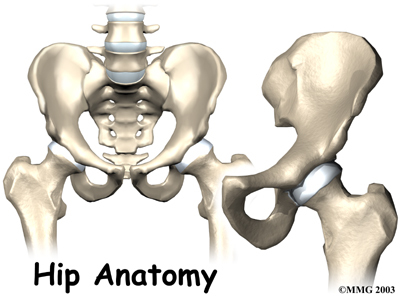 The deepest layer of the hip includes the bones and the joints. The next layer is made up of the ligaments of the joint capsule. The tendons and the muscles come next. The bones of the hip are the femur (the thighbone) and the pelvis. The top end of the femur is shaped like a ball. This ball is called the femoral head. The femoral head fits into a round socket on the side of the pelvis. This socket is called the acetabulum. 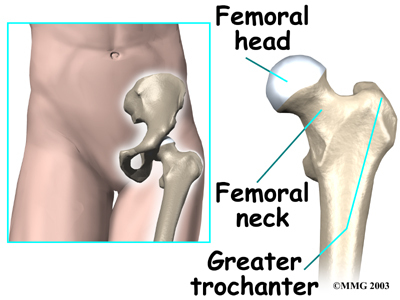 The femoral head is attached to the rest of the femur by a short section of bone called the femoral neck. A large bump juts outward from the top of the femur, next to the femoral neck. This bump, called the greater trochanter, can be felt along the side of your hip. Large and important muscles connect to the greater trochanter. 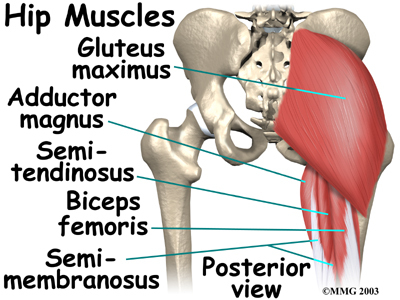 One muscle is the gluteus medius. It is a key muscle for keeping the pelvis level as you walk. Articular cartilage is the material that covers the ends of the bones of any joint. Articular cartilage is about one-quarter of an inch thick in the large, weight-bearing joints like the hip. Articular cartilage is white and shiny and has a rubbery consistency. It is slippery, which allows the joint surfaces to slide against one another without causing any damage. The function of articular cartilage is to absorb shock and provide an extremely smooth surface to make motion easier. We have articular cartilage essentially everywhere that two bony surfaces move against one another, or articulate. 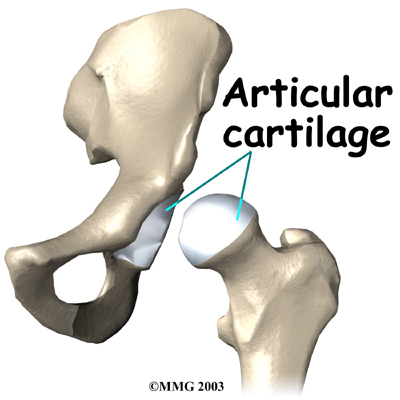 In the hip, articular cartilage covers the end of the femur and the socket portion of the acetabulum in the pelvis. The cartilage is especially thick in the back part of the socket, as this is where most of the force occurs during walking and running. There are several important ligaments in the hip. Ligaments are soft tissue structures that connect bones to bones. A joint capsule is a watertight sac that surrounds a joint. 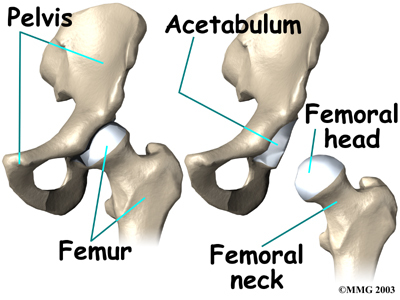 In the hip, the joint capsule is formed by a group of three strong ligaments that connect the femoral head to the acetabulum. 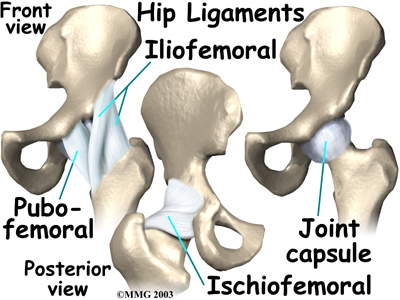 These ligaments are the main source of stability for the hip. They help hold the hip in place. A small ligament connects the very tip of the femoral head to the acetabulum. This ligament, called the ligametnum teres, doesn't play a role in controlling hip movement like the main hip ligaments. It does, however, have a small artery within the ligament that brings a very small blood supply to part of the femoral head. A long tendon band runs alongside the femur from the hip to the knee. 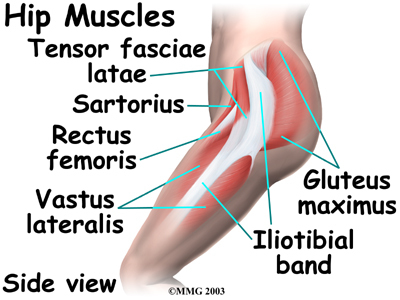 This is the iliotibial band. It gives a connecting point for several hip muscles. 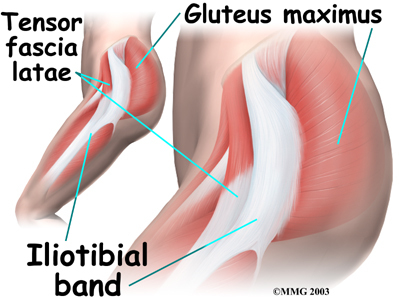 A tight iliotibial band can cause hip and knee problems. 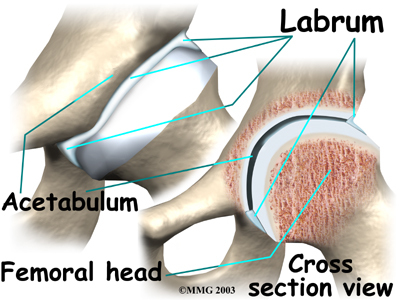 A special type of ligament forms a unique structure inside the hip called the labrum. The labrum is attached almost completely around the edge of the acetabulum. The shape and the way the labrum is attached create a deeper cup for the acetabulum socket. This small rim of cartilage can be injured and cause pain and clicking in the hip. The hip is surrounded by thick muscles. The gluteals make up the muscles of the buttocks on the back of the hip. The inner thigh is formed by the adductor muscles . The main action of the adductors is to pull the leg inward toward the other leg. 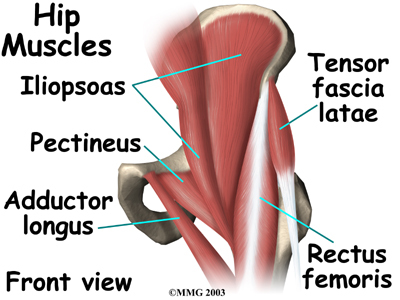 The muscles that flex the hip are in front of the hip joint. These include the iliopsoas muscle. This deep muscle begins in the low back and pelvis and connects on the inside edge of the upper femur. Another large hip flexor is the rectus femoris. The rectus femoris is one of the quadriceps muscles, the largest group of muscles on the front of the thigh. Smaller muscles going from the pelvis to the hip help to stabilize and rotate the hip. Finally, the hamstring muscles that run down the back of the thigh start on the bottom of the pelvis. Because the hamstrings cross the back of the hip joint on their way to the knee, they help to extend the hip, pulling it backwards. All of the nerves that travel down the thigh pass by the hip. 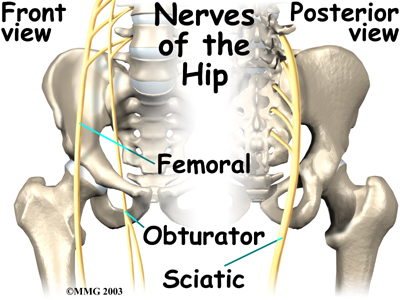 The main nerves are the femoral nerve in front and the sciatic nerve in back of the hip. A smaller nerve, called the obturator nerve, also goes to the hip. These nerves carry the signals from the brain to the muscles that move the hip. The nerves also carry signals back to the brain about sensations such as touch, pain, and temperature. Traveling along with the nerves are the large vessels that supply the lower limb with blood. The large femoral artery begins deep within the pelvis. It passes by the front of the hip area and goes down toward the inner edge of the knee. If you place your hand on the front of your upper thigh you may be able to feel the pulsing of this large artery. The femoral artery has a deep branch, called the profunda femoris (profunda means deep). The profunda femoris sends two vessels that go through the hip joint capsule. These vessels are the main blood supply for the femoral head. As mentioned earlier, the ligamentum teres contains a small blood vessel that gives a very small supply of blood to the top of the femoral head. Other small vessels form within the pelvis and supply the back portion of the buttocks and hip. Where friction occurs between muscles, tendons, and bones there is usually a structure called a bursa. A bursa is a thin sac of tissue that contains fluid to lubricate the area and reduce friction. The bursa is a normal structure. The body will even produce a bursa in response to friction. Think of a bursa like this. If you press your hands together and slide them against one another, you produce some friction. In fact, when your hands are cold you may rub them together briskly to create heat from the friction. Now imagine that you hold in your hands a small plastic sack that contains a few drops of salad oil. This sack would let your hands glide freely against each other without a lot of friction. A bursa that sometimes causes problems in the hip is sandwiched between the bump on the outer hip (the greater trochanter) and the muscles and tendons that cross over the bump. This bursa, called the greater trochanteric bursa, can get irritated if the iliotibial band (discussed earlier) is tight. 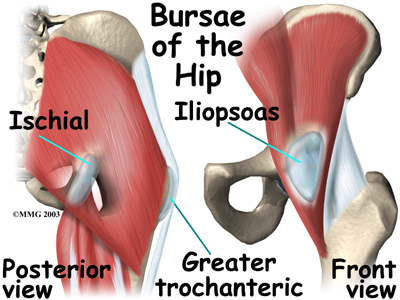 Another bursa sits between the iliopsoas muscle where it passes in front of the hip joint. Bursitis here is called iliopsoas bursitis. A third bursa is over the ischial tuberosity, the bump of bone in your buttocks that you sit on. 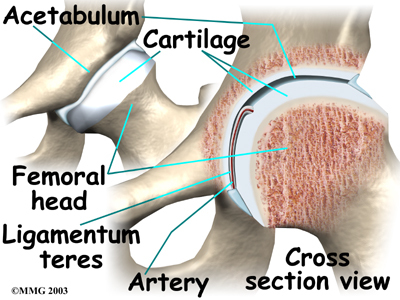 As you can see, the hip is complex with a design that provides a good amount of stability. It allows good mobility and range of motion for doing a wide range of daily activities. Many powerful muscles connect to and cross by the hip joint, making it possible for us to accelerate quickly during actions like running and jumping.